Flexible electronics are great - they're useful in wearable technology, robotics, healthcare and spaceflight. But the components we have right now are easily damaged, destroying their functionality. That's why chemical engineers at the Israel Institute of Technology are developing flexible electronic sensors that can 'heal' damage. It's hoped it could be used to create artificial skin for prosthetic limbs that allow the wearer to feel their environment. The key is a new type of synthetic polymer which is equipped with high-conductivity electrodes and gold nanoparticles. When damaged, it expands to 'heal' cracks that would otherwise break the flow of electricity between the electrodes, allowing it to continue operating. In a paper describing the discovery in Advanced Materials, the researchers wrote: "The healing efficiency of this chemiresistor is so high that the sensor survived several cuttings at random positions." 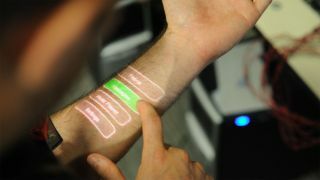 Tan-Phat Huynh, one of the co-developers of the sensor and a specialist in electronic skin, added: "One day, the self-healing sensor could serve as a platform for biosensors that monitor human health using electronic skin."